One of the coolest cars of the 50’s and 60’s are the Corvettes. These cars were and in some cases, are the ultimate sports cars. 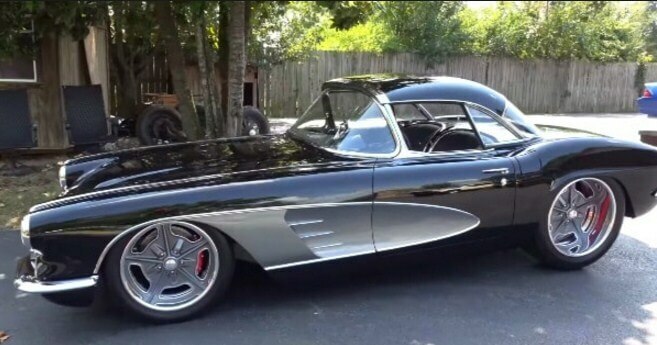 What you see in the video below, is a perfectly restored 1961 Chevrolet Corvette. This stunning piece of machinery was build at home by Jack Shepard. He does everything except the interior. He left that part to the pros at Steve Holcomb Pro Auto custom Interiors. The interior which was designed by Eric Brockmeyer, looks very modern yet reminiscent of the 1960s. Under the hood of this beauty lies a 427 small block Chevy engine, delivering 520 Hp to the rear wheels. David Waterworth drifting with his Viper-powered Chrysler 300C! How to unlock a car door if you have a hanger and no keys! New Yamaha MT-10 Naked R1 Superbike – Ray Of Darkness!